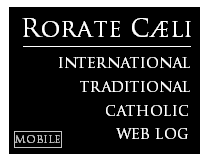 RORATE CÆLI: Radicati EDITORIAL: "We are faithful Sons and Daughters of the Church - we persist out of Love!" Radicati EDITORIAL: "We are faithful Sons and Daughters of the Church - we persist out of Love!" It is for love of the Church that we remain with Tradition. It is for love of the Church that we persist - against all odds – in the celebration only of the Traditional Rite. It is for love of the Church that we even resist Her when She asks us to celebrate and attend the New Rite of the Mass. This is absolutely not about antiquarianism – it is not about a love of the past for the sake of the past. On the other hand, the last liturgical reform, which has distorted the life of the Church for fifty years now, was created not out of love for the Church and Her history, but out of a faulty antiquarianism. Actually, with the last liturgical reform, i.e. the New Mass, there was the will de facto to wipe the slate of the Church’s two thousand year history clean, with the idea of returning to some mythical golden-age of the Church’s beginnings – inventing a super-simplified liturgy which, mistakenly, wanted to go back to the time of the Apostles and Our Lord. If you ask some ordinary lay-folk, they will in fact tell you this, that the modern liturgy in its stripped-down simplicity, corresponds more with the simplicity of the Gospel. When all is said and done, many, including priests, think like this. They also think lovers of Tradition are weak individuals, who still need some ‘useless frills’ to live their faith. In the end, even the shift to post-Summorum Pontificum biritualism is the fruit of this mistaken position: the concession of old things to the faithful who still need them, but at the same time [retaining] unambiguous support for the new liturgy, which [in the first place] was created to rid the Church of Her liturgical tradition. The problem is very serious indeed and requires serious, rigorous judgment. The liturgical reform that followed Vatican II is unhealthy, seeing that it was created upon negative judgments about everything the Church had produced in the liturgical field from the age of Constantine onwards. It was created out of contempt for all the Church had added to Her liturgy over the course of centuries, which was always done to aid faith and prayer. This is not the moment to do a treatise on the liturgy, but we simply offer an example among many: the case of the Offertory. In The New Mass the ancient offertory has been completely removed, with the excuse that this was added only in the Middle Ages, and so it was substituted for a Jewish prayer, a benediction of the earth’s goods. The logic behind this maneuver is typical: being an addition from the Middle Ages, the Offertory Prayer in the Traditional Mass does not belong to the true Mass – it is a useless, repetitive anticipation of the Consecration and has to be eliminated. Yet, this is not the way things are at all: the words pronounced at the Offertory by the priest had been added in the Middle Ages to make explicitly clear, the Church’s intention in the celebration of the Holy Sacrifice of the Lord - this - in order to prevent the priest and the faithful from deviating from the true sense of the Mass. In short, the traditional Offertory is an addition from the Middle Ages, but one that deepens the Old Mass, making it clearer; an addition which helps us to be faithful to the Mass of all time - the one that goes back to Christ and His Apostles. In fact, the problem lies right there: the new liturgy comes from a rejection of all the “additions” the Church has made to the rites in the course of Her history. It is clear that this rejection of the Church’s “work” is extremely dangerous, as it creates in the mind and heart a judgment on the Church: i.e. the Church would have betrayed Christ Himself with this work. This is the spirit of all heresies: yes to Christ, but no to the Church. Separating Christ from the Church is the work of every heretic, and has as its result the loss of Christ Himself. For us, on the other hand, everything the Church has done to pass on the faith, to help Her children pray with greater clarity and purity, to transmit the grace that saves with greater simplicity, is important. The Church has always made additions thus making prayer purer, never ambiguous, to render Her intentions clearer. What's more, when She removed things, they were impure additions, cultural incrustations that men had made, not revealed by Revelation. She removed things that could have laid the way open to heresy, but She never removed what clarified and purified Christian prayer. It is for this reason we traditional Catholics believe we are truer sons and daughters of the Church. Those who are continuously modernizing Her liturgy in contempt of Her history are infinitely much less so. Those who do not love the history of the Church, who do not recognize the value of it, do not love Her. We are truer sons and daughters of the Church, even when we have to resist all the new laws they would like to impose on us; new laws written by people who have skipped over two thousand years and want to return to a Jesus, not brought to us through the historical Church. This is ideology, not the truth. Without the Church, you do not have the real Jesus, but only an idea of Him which makes for the prevailing ideology. On the contrary, you have the Church when you have Her entire history not just the present ecclesiastical institution as a reference, disconnected from Her past. 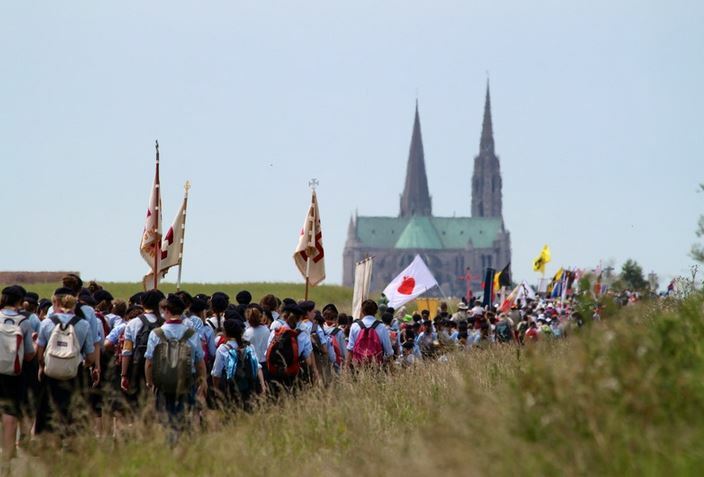 By skipping over two thousand years of history they want to link the present Church to some kind of mythical beginning; and to do this, they need to say that the wind of the Holy Spirit has been blowing these days and freed Catholics up from their cumbersome past. 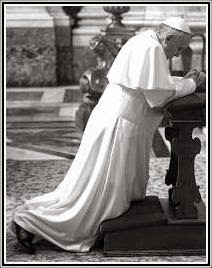 It is out of love for the Church, the Mystical Body of Our Lord, that we cannot, that we must not obey these gentlemen of the archaizing innovations. We must not obey them, but obey only the Church, which has worked and labored in continuity for two thousand years, so that every soul may encounter the Salvation of Christ.